To see the wood that saved us from corruption. Stored in the statue, and in the bridle of sovereignty. 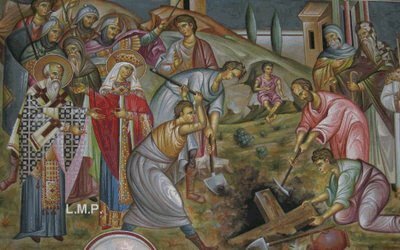 On March 6th the Holy Church commemorates the finding of the Honorable Cross and Nails by Saint Helen, mother of the first Christian emperor of Rome, Constantine the Great. In 326 Saint Helen traveled to Jerusalem, and after much expense and labor she discovered Golgotha, the location where our Lord Jesus Christ was crucified, with the help of a Jew named Judas. Coming to the location, an excavation took place, and three crosses were discovered, namely that of Christ and the two thieves. 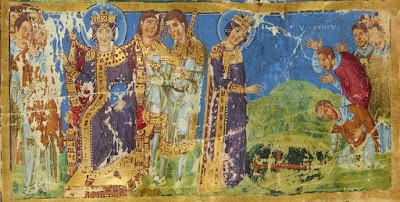 Not knowing which of the three was the True Cross of the Lord, Saint Helen ordered that a dead man who was being carried to his burial be placed on them. As soon as the dead man was placed on the Cross of the Lord, he rose from the dead. 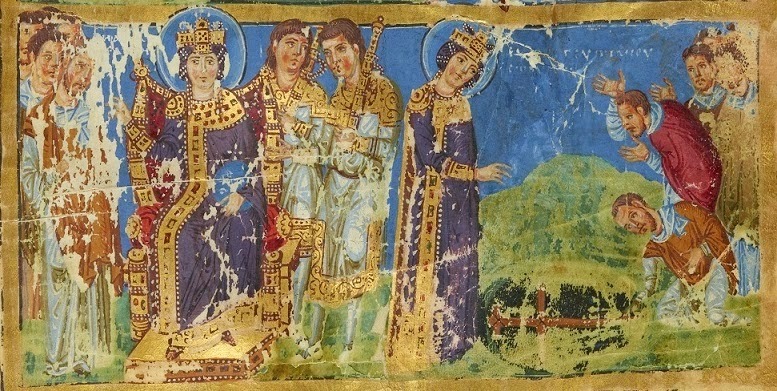 After discovering the Holy Sepulcher nearby, she informed her son Constantine of the great discoveries, and he immediately ordered the erection of the Temple of the Resurrection. As for the relic of the Honorable Cross, Constantine the Great left half behind in Jerusalem, where a large portion of it can be found till this day, while the other half along with the Nails were brought to Constantinople. Euthymios Zygabenos says that the True Cross of the Lord was distinguished by the inscription of Pilate over one of the crosses that said Christ was King of the Jews. Also, some say that a woman was near death and immediately healed when she touched the True Cross, while others say fragrant basil grew over the location of the True Cross of Christ. The two crosses of the thieves were brought to Constantinople and placed in a porphyry pillar in the forum, with other relics. The Honorable Nails, upon their discovery, where shiny and bright when they were discovered, while the nails of the thieves were black and rusted. These Nails were brought by Helen to Constantinople, as a gift to her son. One was placed in the bridle of his horse, to fulfill the prophecy of Zachariah 14:20, "On that day Holy to the Lord Almighty will be inscribed on the bridle of the horses." The second was placed in his battle helmet. The third, according to Ambrose, was thrown by Helen into the Adriatic Sea in order to calm a storm, though Dositheos of Jerusalem does not believe this story. Socrates says that the Cross and Nails were placed in the pillar of the statue of Constantine in Constantinople, to protect the City. Some say there were only three nails, while others say they were four, with two nails used for each foot rather than one nail for both feet. 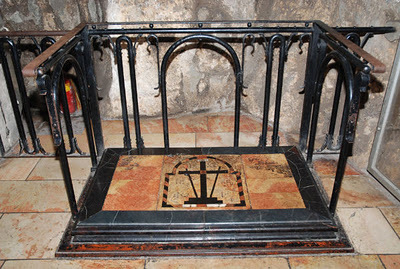 The Cave of the Finding of the Honorable Cross, which contains a statue of Saint Helen holding the Cross, and the spot where the Cross was discovered, located in the Temple of the Resurrection in Jerusalem. The spot where the Honorable Cross was discovered.